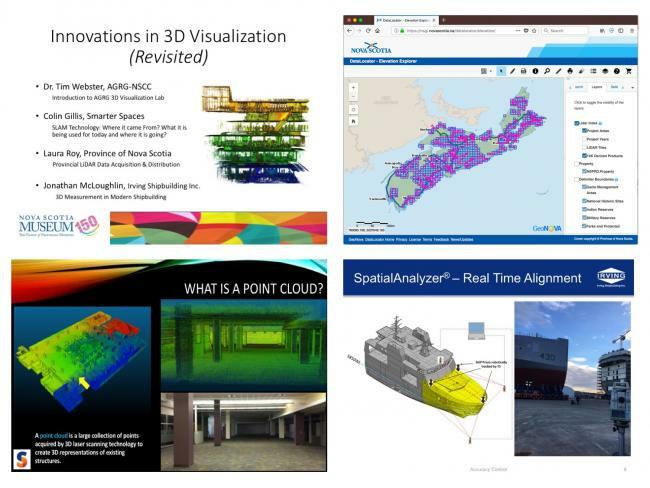 The Centre of Geographic Sciences ( Nova Scotia Community College) demonstrated how coastal erosion is being studied with applied research using LiDAR, photogrammetry and new virtual reality tools. The Nova Scotia Geomatics Centre provided an overview of new LiDAR elevation data will be available for research and planning projects. There was also several presenters demonstrating how 3D scanning and surveying are being used today in Nova Scotia businesses and industries. The recent 3D workshop also featured a few examples of how 3D scanning and animation software is being used in Museum research and interpretation. An example includes the 3D scanning of Eldon George’s “world’s smallest dinosaur trackway” found near Parrsboro Nova Scotia. A high-quality 3D digital model of the fossil trackway was developed using digital photographs and scanning software. The 3D digital model captures the details of the ‘dinosaur’ footprints that cover a surface of a sandstone boulder that is 200 million years old. These tiny fossil footprints are only 2 cm long. The use of 3D scanning and models to study paleontology specimens provides exciting new ways to examine important fossils. Models are easily rotated and explored, providing an ability to view a specimen from views not possible with the real specimens. The digital models also provide new ways to share and interpret specimens for research or exhibit. Future opportunities for collaborations with museums include larger scanning projects, or use of models for development of high-quality animated videos that depict specimens in exciting new ways.